(J. Mater. Sci., Mater. Med., 18, No. 7 (2007) 1339-1344). The shortest ageing time with non-solvent and the longest time and velocity of centrifugal processing yield the smallest particles with the highest level of uniformity. 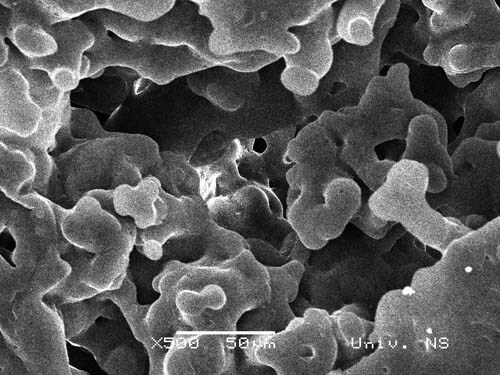 Furthermore, the size and shape of the particles can also be influenced by the stabilizer used. Polyvinyl alcohol (PVA) and polyvinyl pyrrolidone (PVP) are the most commonly used stabilizers for polymer particles. 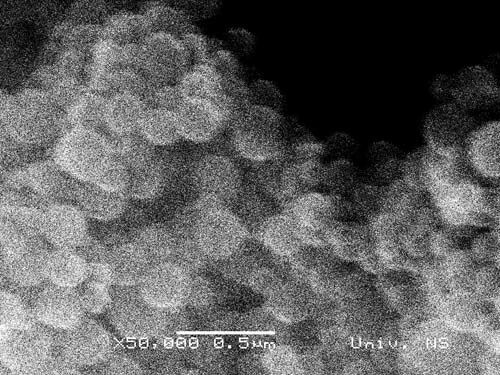 PVA and PVP create negatively charged DLPLG particles (Material Science Forum, Vol. 555 (2007) 447-452). Fig. 1. SEM images of DLPLG particles with different ageing time with non-solvent and different time and velocity of the centrifugal processing: a) 10 min and 15 min on 1500 rpm; b) 30min and 30 min on 3000 rpm; c) 5 min and 60 min on 4000rpm; d) 5 min and 60 min on 4000 rpm; e) 5 min and 120 min on 4000 rpm (Image: J. Mater. Sci., Mater. Med., 18, No. 7 (2007) 1339-1344). 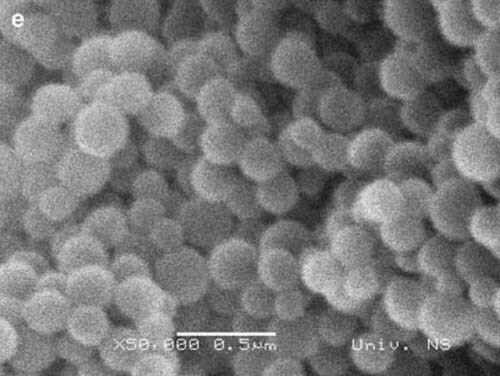 In the Laboratory of the Institute of Technical Sciences, vitamin C was successfully encapsulated into DLPLG nanoparticles [Journal of Biomedicine and Biotechnology, (2007) accepted]. Ascorbic acid (vitamin C) is essential to preserving optimal health and is used by the body for many purposes. The problem is that ascorbic acid easily decomposes into biologically inactive compounds, which considerably limits its application in the field of pharmaceutics, dermatology and cosmetics. 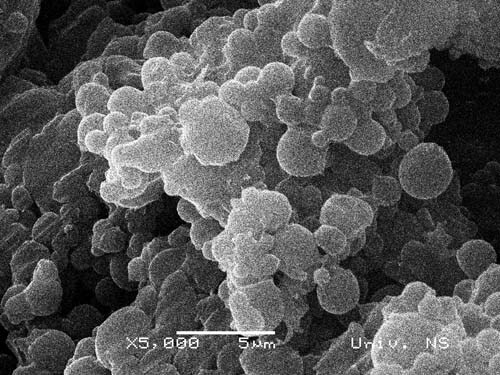 It is assumed that its chemical instability can be overcome and that a higher, more efficient and equally distributed concentration over an extended period of time can be achieved by its encapsulation into a polymeric matrix. 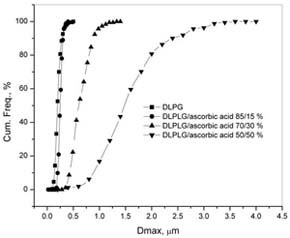 Particles of DLPLG with different content of ascorbic acid have different morphological characteristics, i.e. variable degree of uniformity, agglomeration, size and spherical shaping. 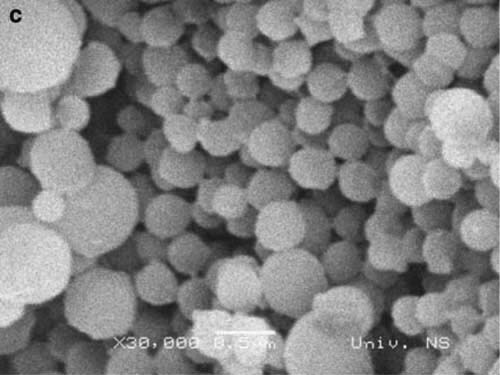 Mean sizes of nanoparticles, which contain DLPLG/ascorbic acid in the ratio of 85/15 %, is between 130 and 200 nm, depending on stereological parameters considered (maximal diameters Dmax, feret X or feret Y). 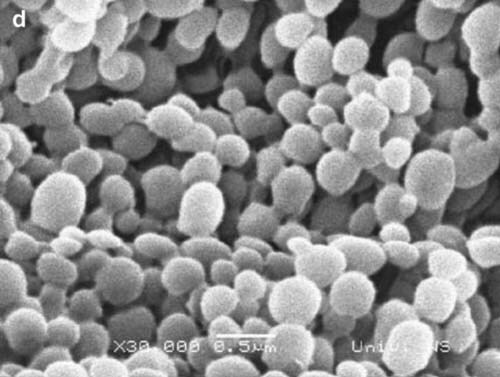 By introducing up to 15% of ascorbic acid, the spherical shape, size and uniformity of the DLPLG particles is preserved. Fig. 2. 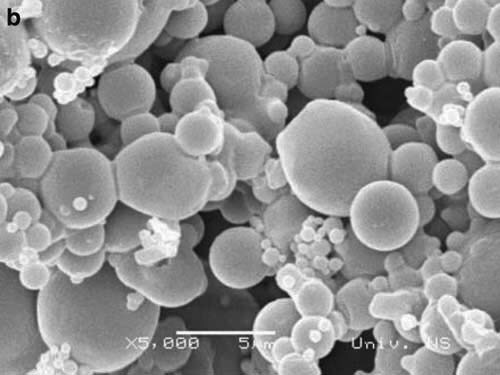 SEM images of a) DLPLG particles and particles with different ratio of DLPLG and ascorbic acid; b) DLPLG/ascorbic acid 85/15%; c) DLPLG/ascorbic acid 70/30%; d) DLPLG/ascorbic acid 50/50%; e) DLPLG/ascorbic acid 30/70 % (Image: Journal of Biomedicine and Biotechnology (2007) accepted). Fig. 3. Comparative results of the stereological examining of a) DLPLG particles and particles with different ratio of DLPLG and ascorbic acid; b) DLPLG/ascorbic acid 85/15%; c) DLPLG/ascorbic acid 70/30%; d) DLPLG/ ascorbic acid 50/50%; based on maximal diameter of the particle Dmax (Image: Journal of Biomedicine and Biotechnology (2007) accepted). Fig. 4. Comparative cumulative curves of the release of the ascorbic acid in percentages over the period of time of the degradation (Image: Colloids and Surfaces B: Biointerfaces (2007), accepted, doi: 10.1016/j.colsurfb. 2007.05.011). 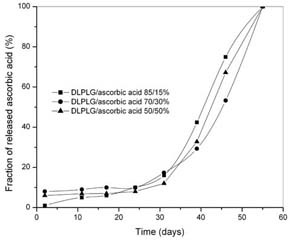 The degradation of the DLPLG with and without ascorbic acid within the physiological solution have been tracked in vitro for eight weeks; it has been determined that DLPLG completely degrades within this period, fully releasing all encapsulated ascorbic acid (Colloids and Surfaces B: Biointerfaces, (2007), accepted, doi:10.1016/j.colsurfb.2007.05.011). The concept of the method developed in these researches will be also used for other biodegradable polymers and medicaments. M. Stevanović, N. Ignjatović, B. Jordović, D. Uskoković, "Stereological analysis of the poly (DL-lactide-co-glycolide) submicron sphere prepared by solvent/non-solvent chemical methods and centrifugal processing", Journal of Materials Science: Materials in Medicine, 18, No. 7 (2007) 1339-1344 (doi:10.1007/s10856-007-0156-8). 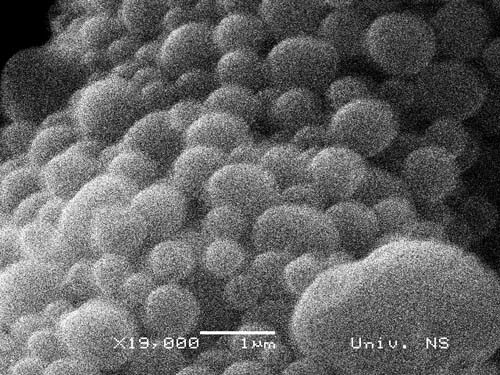 M. Stevanović, B. Jordović, Z. Nedić, D. Miličević, "The stabilizer influence on morphological characteristics of poly (DL-lactide-co-glycolide) nanospheres", Material Science Forum, Vol. 555 (2007) 447-452. 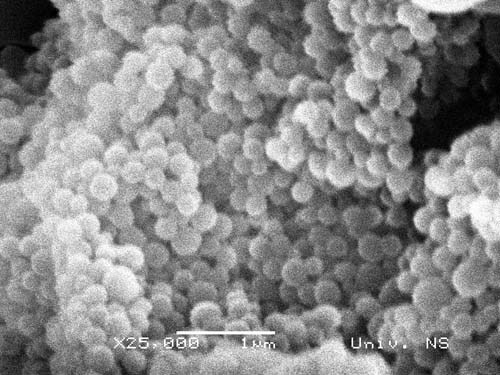 M. M. Stevanović, B. Jordović, D. P. Uskoković "Preparation and characterization of poly(D,L-lactide-co-glycolide) microparticles containing ascorbic acid", Journal of Biomedicine and Biotechnology (2007), accepted.